Washington, DC - At the end of July, the House of Representatives approved legislation for H.R. 1108, a bill that would give the Food and Drug Administration (FDA) the ability to regulate the tobacco industry. The measure, which came down to 326 votes for, and 102 against, would allow the FDA to require the disclosure of tobacco ingredients, ban fruit- and candy-flavored cigarettes, and mandate larger health warnings as well as the reduction and possible elimination of harmful substances from tobacco products. It would also grant the FDA nearly unlimited power to regulate how tobacco products are merchandised and sold; grant all other federal agencies as well as state, county, and city governments power to adopt more restrictive regulation the the FDA�s, including the the right to ban all advertising, promotion, and sale of tobacco products in retail stores. These actions conclude a lawsuit that had started in 2006, and General Cigar continues to employ �a special task force consisting of attorneys and a team of private investigators from across the United States to assist it in its trademark enforcement efforts. Lotus MJYX Named S.T. Dupont Distributor in U.S.A.
Warwick, RI - Paris-based S.T. Dupont has appointed Lotus MJYX, LLC of Warwick, R.I. as its wholesale distributor for the United States. Lotus, a Florida corporation, has facilities and offices in Rhode Island. The Lotus management team is well known in the industry with over 75 years experience in S.T. Dupont�s core product categories. Alain Crevet, S.T. Dupont�s president of the management board, selected Lotus to fully establish the brand in the U.S. market. �We are totally committed to S.T. Dupont�s brand strategy� states Michael Reynolds, Lotus president and c.e.o. Recently, Reynolds and Lotus executive vice president Jim Galle toured the S.T. Dupont factory in Faverges, France, which is currently in the final stages of rebuilding one of the wings of the facility which was damaged by a fire in January of this year. Production of lighters and writing instruments was halted since workshops destroyed by the fire are necessary for the production process. �S.T. Dupont has done a remarkable job rebuilding the section which housed the polishing and plating departments,� explains Reynolds. Production capacity will be back to 100% at the end of the year, according to S.T. Dupont�s management. Founded in 1872 by Simon Tissot-Dupont as a luxury leather good producer, the company introduced its iconic Chinese lacquer on metal technique in the 1930s, the first pocket petrol lighter in the 1940s, and luxury jewelry pens in the 1970s, continually innovating its luxury offerings. S.T. Dupont, c/o Lotus MJYX, 30 Coronado Road, Warwick, RI 02886, Tel: (401) 921-5216, Fax: (401) 921-5218, Email: Aftersalesservice@STDupontUS.com or Customerservice@STDupontUS.com, Web: www.STDupontusa.com. New York, NY - Philip Morris International (PMI) has announced that it is buying Canadian cigarette maker Rothmans Inc. for approximately $1.95 billion, seeking to purchase all outstanding common shares for $29.28 each. Philip Morris International currently owns a 40 percent stake in Rothmans, Benson & Hedges Inc.; the remaining 60 percent interest is held by Rothmans Inc. The company produces and sells Benson & Hedges, Rothmans, and Craven A premium brands and Mark Ten value brand, among others. The transaction is projected to be completed by September 30. Ft. Lauderdale, FL - Altadis USA has made another demonstration of its �zero-tolerance policy against cigar counterfeiting and trademark infringement,� this time with regard to the Montecristo trademark. The company will also place Rojo�s and its proprietary cigarette displays at 143 Wal-Mart Supercenter stores and 63 of Wal-Mart�s Superama stores throughout Mexico. Tobacco One will install approximately 3,000 cigarette displays, one at each check-out location, within the Wal-Mart Mexico organization. Tobacco One also announced that it had canceled its agreement to purchase a �leading U.S. tobacco product manufacturer� for $9.5 million. The Association has partnered with Colin Ganley of cigarresearch.com, releasing two surveys to help determine the scope and size of women cigar smokers. Haddad also hopes to mobilize the Association and its members against anti-cigar legislation. �In this day and age, cigar shop owners, regardless of gender, cannot afford complacency,� says Haddad. Columbus, GA - The International Premium Cigar and Pipe Retailers Association (IPCPR) has established the IPCPR political action committee (PAC), a legal means for the trade association to participate in the electoral process. Since corporate money is banned from use as campaign contributions, many groups and trade associations form PACs to obtain additional visibility. The trade association notes that by pooling individual members� resources, more significant contributions can be made to those candidates whose views align with the IPCPR. �Gaining visibility in the political process through financial participation is important to the future of IPCPR�s political agenda,� adds Rowe. Contributions are limited to $5,000 per year, and must be made by individuals and checks must be from personal accounts, not company for corporate checks. Foreign-based or owned companies, or their wholly-owned subsidiaries, are not permitted to contributed to the PAC. Federal election law requires that corporations provide prior written approval to the IPCPR PAC before it may solicit individuals for donations, but all contributions must be voluntary - it is illegal for employers to coerce employees to contribute. For additional information, contact IPCPR, Tel: (706) 494-1143, Email: info@ipcpr.org..
Imperial Tobacco Group PLC completed the acquisition of Lignum-2 Inc, a wholesaler of tobacco products, for $22 million in May, which included the deep-discount cigarette and fine cut tobacco brand Rave and premium hand-rolled cigar brand Troya. The company estimates that its share of the fine cut tobacco sector in the U.S. has now grown to over 7 percent as it continues to widen distribution of our fine cut tobacco portfolio. In its July interim management statement, Imperial estimates that the overall U.S. cigarette market is returning to a more normal annual volume decline of 3 to 4 percent as the impact of the reversal of the 2006 trade stock build diminishes. The company estimates that fine cut tobacco market volumes are still growing at around 10 per cent per annum. Imperial grew its cigarette market share to 4.2 percent with both its main brands, USA Gold and Sonoma, performing well, up from 3.9 percent in 2007. In April, Imperial launched Davidoff with promotional activity focused initially on key cities. Altadis U.S.A. has taken over distribution of Lignum-2�s Troya premium cigar brand, with manufacturing arrangements remaining intact: Troya is made in the Dominican Republic, while Troya X-Tra, Troya Classico, and Troya Reserva Maduro are all made in Nicaragua. Miami Cigar & Company has completed a distribution agreement with Brun del R� Cigars of San Rafael de Escaza, Costa Rica, Rene J. Castaneda, national sales manager of Miami Cigar & Co., announced. Carlo Corazza, founder and owner of Brun del R�, completed the negotiations with Castaneda and Miami Cigar founder Nestor Miranda on a three day trip to Miami from Costa Rica. Miranda and Corazza met in Costa Rica some months ago, and the conversations have been ongoing. Descended from the Bourbon-Parma kings of Italy, the family was involved long ago in growing and trading tobacco. Brun del R� is the result of Corazza�s fondness for cigars, and his desire to produce a premium, hand made cigar utilizing Costa Rican wrapper. 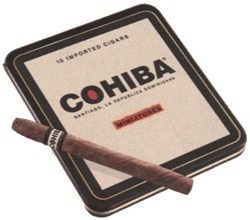 The cigars has previous been distributed only in Europe and Asia. Brun del R� is produced in three distinct lines and offered in four sizes. 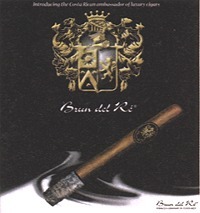 Brun del R� Premium is produced using Nicaraguan fillers and binders and Ecuadoran Connecticut wrapper. �With a sweet flavor and sumptuous aroma, this smooth smoking cigar has become a favorite of those seeking to experience cigars,� says Castaneda. Brun del R� Gold, also with an Ecuadoran Connecticut wrapper, appeals to �more experienced smokers, as it is blended and smokes with complexity and nuance,� Castaneda explains. Finally, Brun del R� Colonial is the �pi�ce de r�sistance of the Brun del R� effort,� says Castaneda, a full-bodied blend of Nicaraguan and Costa Rican filler tobaccos in a �lush, luxuriant� Costa Rican maduro wrapper �that will satisfy the most discriminating palate. Miami Cigar & Company distributes Tatiana, Don Lino, Don Lino 1989, Don Lino Africa, La Aurora, Leon Jimenes and Ducados, along with specialty smokers accessories. Moorepark, CA. - Kretek International, Inc. has recently acquired the assets of Tobacco Outlet Business LLC, a North Carolina company, which includes Tobacco Outlet Business magazine and Tobacco Plus Conference & Exposition. Tobacco Plus Expo is an international trade show for the tobacco industry that is held annually in the United States. The event brings together tobacco manufacturers, wholesalers, and retailers from the U.S. and abroad to meet and discuss tobacco industry issues, opportunities, products, and relationship building. It combines a trade show exhibit hall with educational seminars. Previously held every year in Las Vegas, the Tobacco Plus Expo was no longer able to secure a smoking ban exemption in Nevada. The upcoming show dates are May 6�7, 2009 at the New Orleans Convention Center, Louisiana. Reuter Exposition Services LLC, located in Branford, Conn., has been retained by Kretek International as show management for the 2009 event. Tobacco Outlet Business Magazine was first published in 1997 and targeted the then-emerging tobacco outlet market. The magazine is published six times per year. Established in 1983, Kretek International, Inc. is a privately held company headquartered in Moorpark, Calif. The company is best known for the manufacture and distribution of clove cigarettes and a full range of tobacco and tobacco accessory products. For more information on Tobacco Plus Expo, contact Susan Reuter, president, Reuter Exposition Services LLC, Toll-free: (888) 737-3976, Fax: (203) 483-5778, Email: info@reuterexpo.com.